The theatrical re-release of Avatar will have a bunch of extra content, and so of course that extra content will be making the voyage from the theater, across the expanse of space, and into your living room- via special edition's on both DVD and Blu Ray disc. If you're a fan of the film, there's a lot of new stuff to do and watch here (not the least of which being the complete story) so the extra purchase is probably a no-brainer. I myself have never seen the movie (yeah, yeah, I know) so I will absolutely be picking this one up on Blu. Three-Disc Set of the Worldwide Theatrical and Home Entertainment Phenomenon Contains Even More of the AVATAR Experience with Over Eight Hours of Never-Before-Seen Material and In-Depth Exploration into the World of Pandora! Director James Cameron is unlocking the secrets of Pandora and taking fans on a guided tour of his vision with the highly anticipated release of AVATAR Extended Collector’s Edition on Blu-ray and DVD releasing November 16th in North America and rolling out internationally from November 15th. These exclusive Extended Collector’s Editions come with iconic, collectible packaging to get fans to experience Pandora like never before. With three versions of the film, AVATAR fans will get an all-new extended cut of the film and hours of never-before seen material including over 45 minutes of amazing deleted scenes! "I told our team --- let's do the ultimate box set of Avatar, with everything in it the fans could possibly want. There's an extended length cut that's sixteen minutes longer, plus documentaries, behind the scenes featurettes, artwork and over 45 minutes of deleted scenes. Everything worth putting into a special edition is in this set," said James Cameron. The three-disc AVATAR Extended Collector’s Edition Blu-ray and Extended Collector’s Edition DVD will both feature the original theatrical release, a special edition re-release, family audio track with all objectionable language removed and new collector’s extended cut with sixteen more minutes including an exclusive alternate opening Earth scene. Viewers will journey to the depths of Pandora with filmmakers during “Capturing Avatar“ an in-depth feature length documentary covering the 16 year filmmaker journey including all new interviews with James Cameron, Jon Landau and cast and crew exploring James Cameron’s unique vision for the film seen by more than 310 million people worldwide. The Oscar and Golden Globe winning epic is the highest grossing film of all time, taking in over $2.7 billion in worldwide box office. It is also the top-selling Blu-ray disc of all time. 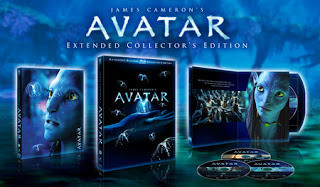 The AVATAR Extended Collector’s Edition Blu-ray will also have even more bonus material and interactive viewing. Through the unparalleled, interactive technology of Blu-ray, fans can dive further into the world of the Na’vi and experience the #1 international sensation from behind the scenes, with a “master class” on the production of the film. Leveraging the interactivity of Blu-ray, viewers can experience the full film in three stages of production: Performance Capture, Template (1990’s video game version) and Final as well as a composite of all stages in “Pandora’s Box”. This will be supported with interviews by Jim Cameron and the filmmakers and serve as a “master class” on the making of AVATAR. AVATAR Extended Collector’s Edition will be available on Blu-ray Disc and DVD everywhere in the United States and Canada on November 16th. International release dates and product information may vary by market. Please contact your local Twentieth Century Fox office to confirm country specific information. The Smurfs invade Farmville... Kinda.